A man who was placed behind bars after being beaten by sheriff’s deputies during his arrest in San Bernardino County last week was bailed out of jail Sunday night, according to jail records. Francis Jared Pusok was released from the West Valley Detention Center in Rancho Cucamonga at 6:56 p.m., inmate records show. The beating is being investigated by the San Bernardino County Sheriff's Department and the FBI. Pusok met with his attorneys and the mother of his children while he was behind bars earlier Sunday. "His head hurts, his legs are weak," said the girlfriend, Jolene Bindner, in an exclusive interview with NBC4. "He's just really feeling the soreness in his body." 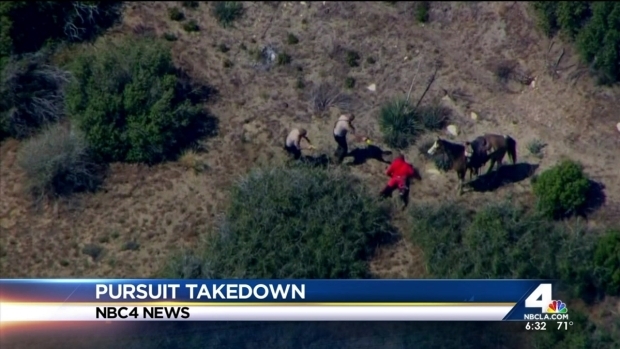 Aerial video shows a group of San Bernardino County Sheriff's deputies kicking and punching a man who led deputies on a pursuit in the high desert northeast of Los Angeles Thursday, April 9, 2015. Bindner said her anger has turned to fear after hearing her boyfriend's account of what deputies allegedly told him during the beating. She said a deputy whispered in his ear as he was taken into custody. "It was something along the lines that 'This isn't over,' I believe that’s what I had heard as the quote," Bindner. "That concerns me because we have children together and I don't want any type of retaliation against me or possibly my children." Deputies beat the 30-year-old Apple Valley resident while taking him into custody Thursday at the end of a pursuit in the high desert, about 90 miles northeast of Los Angeles. 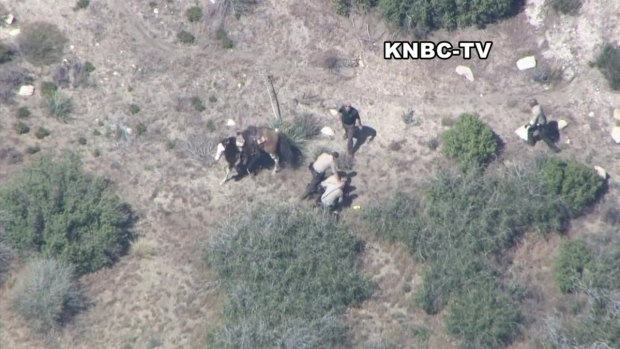 The pursuit took place in a vehicle, on foot and on horseback after Pusok allegedly fled deputies serving a warrant, authorities said. Pusok was riding a horse when a sheriff's helicopter dropped deputies nearby who gave chase to Pusok. He fell off the horse, a deputy used a Taser on him and the a group of 10 up to 10 deputies surrounded him, some punching and kicking him for two minutes. NBC4's chopper captured video of the incident. 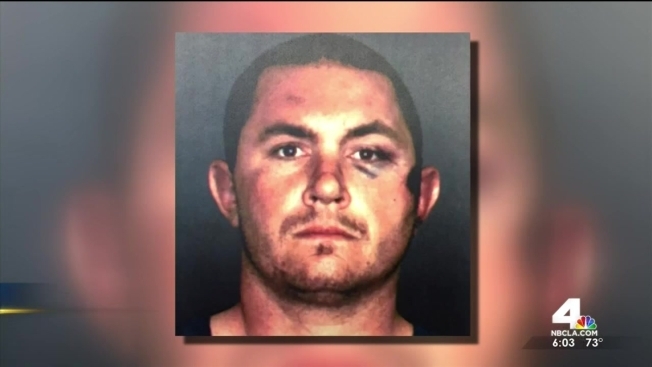 Ten San Bernardino County Sheriff's Department deputies were placed on paid administrative leave as the department investigates the beating. Lawyers for a man beaten by sheriff’s deputies at the end of a pursuit claim the incident was not the first time their client was roughed up during an encounter with law enforcement. Gadi Schwartz reports for the NBC4 News at 6 p.m. on Sunday, April 12, 2015. Sheriff John McMahon said the beating "appears to be excessive based on what I saw on video" at a news conference Friday. Also Friday, the FBI announced it was conducting its own investigation into the beating. Asher Klein contributed to this report.